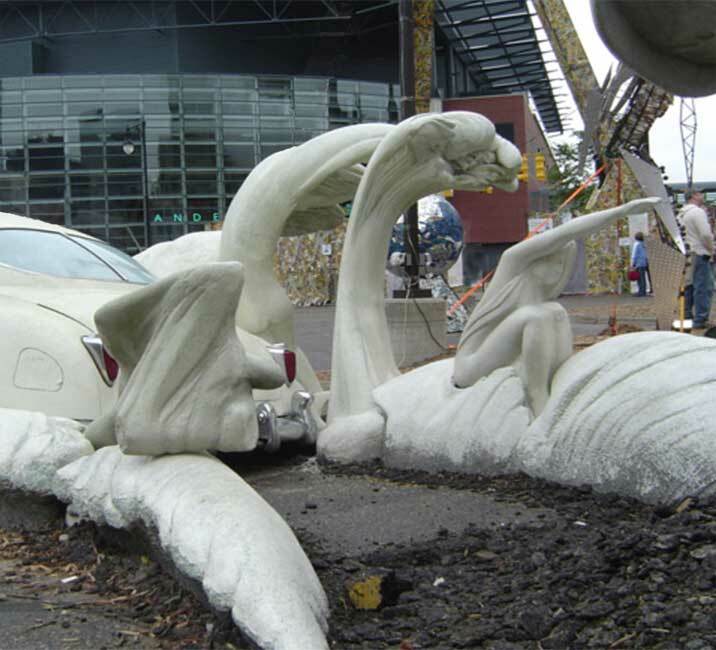 2009, carved foam waves with concrete and glass coating, 66 feet by 12 feet by 12 feet. 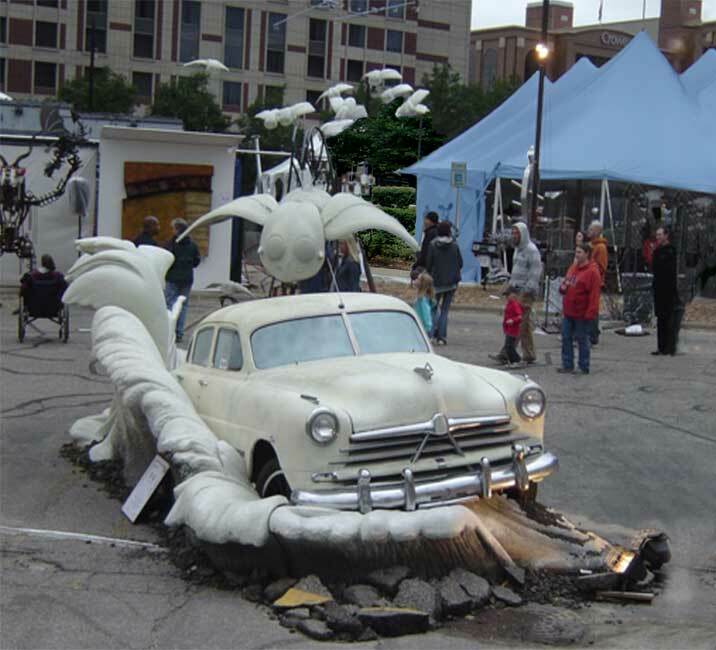 Car Chase was created as a temporary installation in 2009 and was first displayed at the B.O.B. (Big Old Building), a popular Grand Rapids, Michigan premiere, nightlife venue, directly across from the Van Andel Arena. Asphalt rubble to match the parking lot surface. The Car Chase separate pieces have been exhibited in several cities and venues. Car Chase, an Obsolete American Car, (a '50 Hudson) is being Chased by a swarm of flying invaders from a foreign shore (VW Beetle Nikes). 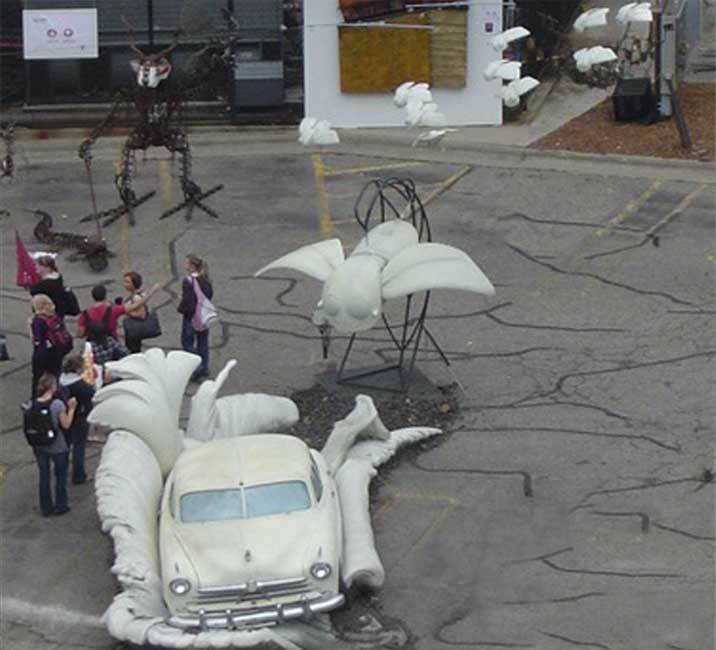 The car has careened into the parking lot dislodging pavement and a group of human forms in it’s wake. 1. 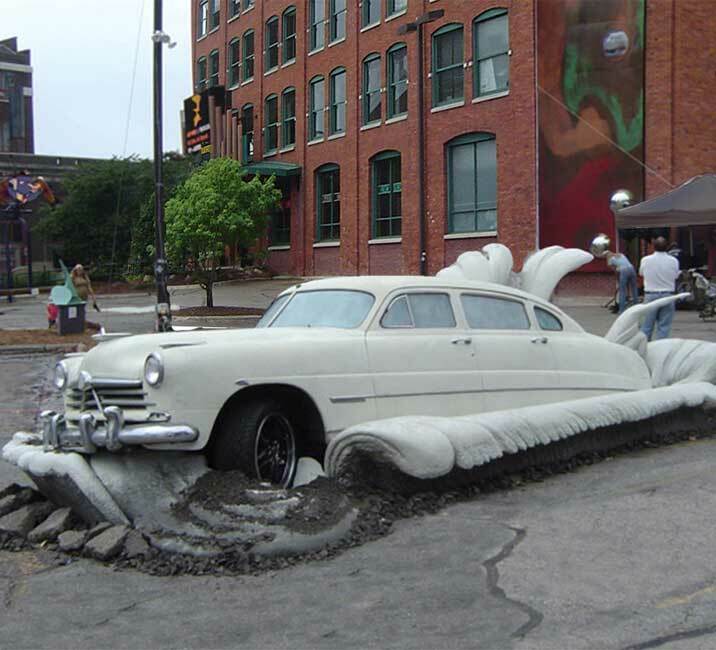 The "Major Impact" (the car, splash, wake and figures) is an allegorical composition he has worked on for many years about the effect of the automobile on our world. 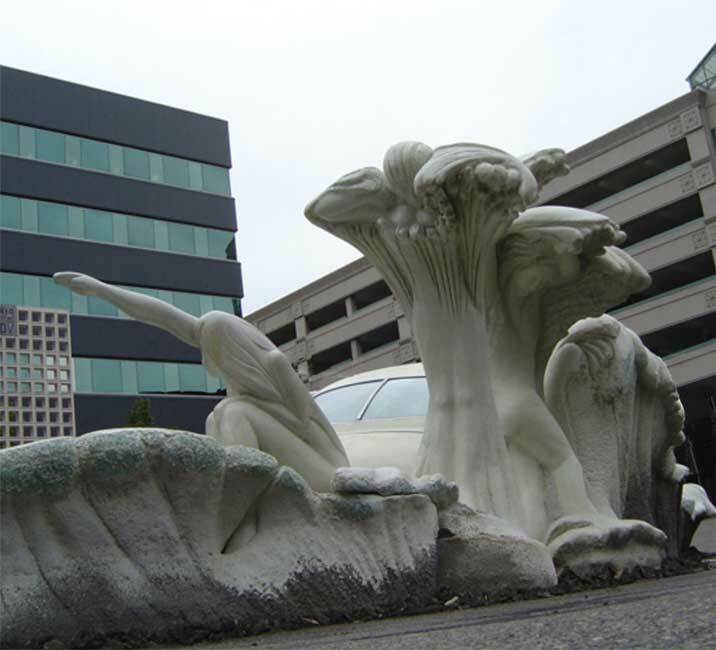 The stand alone figures from this composition have been exhibited in several cities as separate sculptures. 2. "Bugswarm" is a hanging mobile concept designed for a German airport. "Bug" was originally designed as one of his "Nike"series and is composed solely from VW Beetle components. The full size "Bug" was constructed from molded car parts and has a wingspan just over 10 feet. 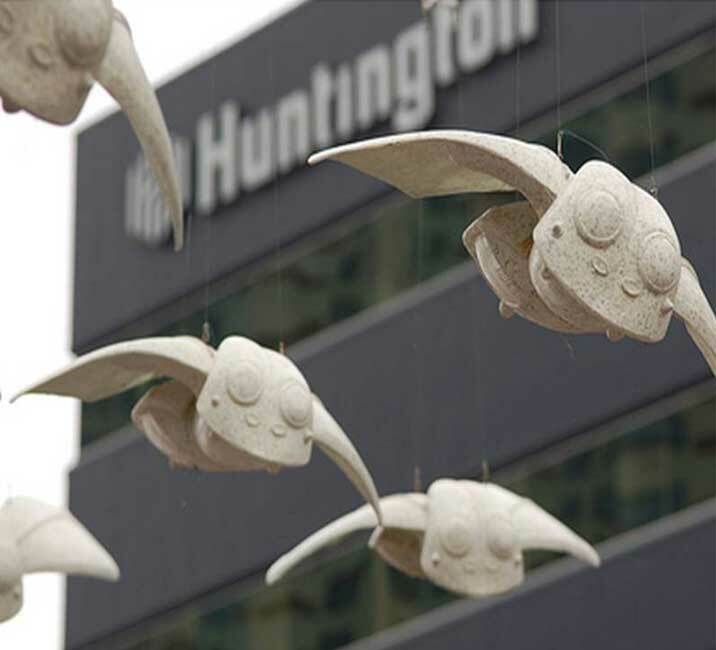 The smaller bugs at 24 inches were built to hang in a suspension mobile and swarm around each other. These works have been exhibited in several cities and venues. 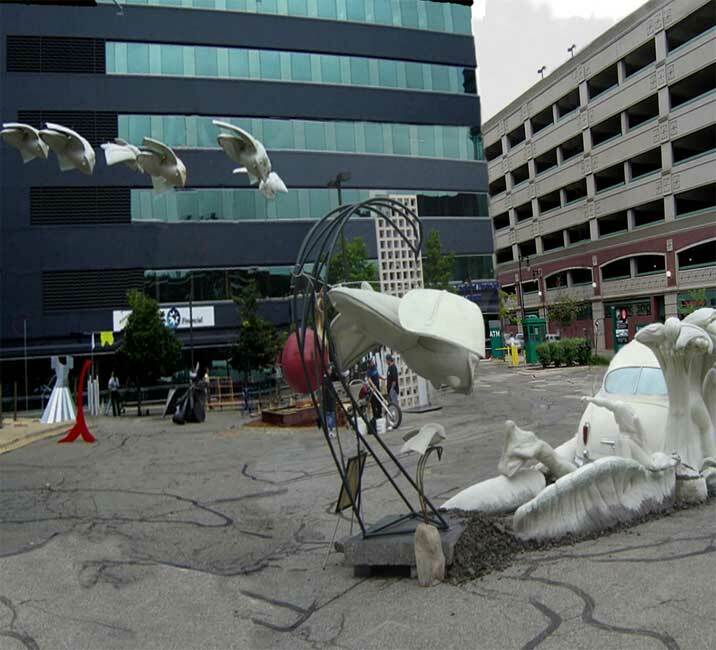 All these concept pieces were in various states of execution when the announcement of the first ArtPrize competition came in 2009. Tj secured the venue and got permission to string an engineered cable system from the existing 20 foot parking lamps to make the entire composition work. It was extremely popular and remained in the top 25 throughout the competition. It is featured in the official ArtPrize Photography book. Bug, Impact Man, Impact female, Impact figure #5, Harbinger, Bug swarm, Bug alight. The development of the "Major Impact" group and the "BugSwarm" concept continue.